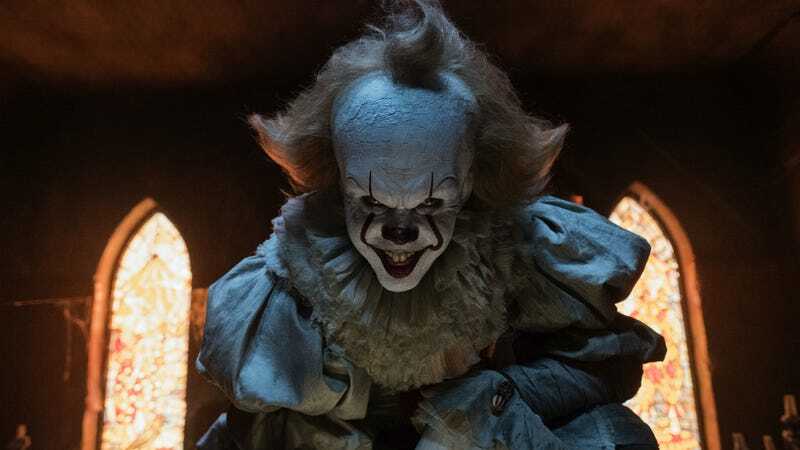 Pennywise looms in the first film, and he’ll loom anew in the sequel. In the footage, we see a grown-up Beverly (Jessica Chastain) knock on the door of an old apartment. The name on the door says “Kersh,” but when an old woman answers, Beverly explains she thought it said “Marsh,” because she’s looking for her father. The woman opens the door and says she’s sorry to be the one to tell her, but Mr. Marsh passed away. But come on in, it’s the least she can do. Mrs. Kirsh asks Beverly if the apartment is like she remembers, and Beverly says yes, but it’s cleaner. She looks around bit goes into her old room, and finds the poem that Ben wrote her in the first movie. It quickly flashes back to her younger self, still excited by the poem. The woman asks if Beverly wants some tea, which she accepts, and you just begin to get the sense something is not right, from the odd music she puts on the record player to the flies on the window. Mrs. Kirsh apologizes for the heat and says it gets so hot you could just about die. She then adds something along the lines of, “You know what they say about death? No one who dies in Derry ever really dies.” Then Mrs. Kirsh just stops moving and stares at Beverly. Frozen. Staring. After a few beats too many, she reanimates and asks Beverly what it’s like being back in Derry. Beverly says it’s strange, and Mrs. Kirsh asks “Strange, how?” Meanwhile, we looks closer at Mrs. Kirsh’s chest and it looks be be very, very burned. Then there’s a ding! Mrs. Kirsh has been making cookies. At this point, Beverly wants to leave but Mrs. Kirsh insists she stay. She goes into the kitchen as Beverly begins to look at more photos. As Beverly looks, in the background we see Mrs. Kirsh peeking in at her in a very, very uncomfortable way. Beverly asks about the photos and Mrs. Kirsh says they’re of her and her father...who moved to Derry and joined the circus. She’s still creeping around in the shadows when we cut and realize who her father is. A clown. “I was always Daddy’s little girl,” Mrs. Kirsh says from the darkness of the other room. “What about you? Are you still Daddy’s little girl, Beverly? ARE YOU?” And we see the woman, or something, jump out of the kitchen at Beverly as Beverly runs out of the house. The footage then cut to a montage. We see the Losers’ Club reunited and older, looking at their younger selves in a reflection. We see Bill (James McAvoy) tell Beverly, “We can do this, but we have to stick together.” Pennywise is floating above the town holding balloons. We see another shot of him ripping his own face off, followed by two white hands reaching out of the darkness to grab a small red light. Then, out of those shadows, we hear a “Hello!” and Pennywise pops out his face. Some of this footage is sure to be in a trailer when it comes, but at least judging by this tiny tease, Chapter 2 feels like a worthy follow up to the original. It: Chapter 2 hits theaters on September 6.